comal caliente: Charcutepalooza, bacon, frijoles charros! This is my first official Charcutepalooza post and I couldn’t be happier about the challenge: bacon! As people who have read a few of my posts can figure out, I’m a pretty big fan of pork, especially crispy, salty pork, so I definitely had to participate in the bacon challenge. For those that don’t know, Charcutepalooza is a year long event, but it is also a movement in meat-making. It began all thanks to Mrs. Wheelbarrow and The Yummy Mummy after a discussion about charcuterie and the challenges involved in salting, smoking and curing meat. Charcutepalooza has gained much popularity and there are various bloggers, cooks, food nerds and lovers of meat participating. I encourage you to check out the information at http://www.charcutepalooza.com/ (handy link in the right margin of this blog). I also have to give credit to Michael Ruhlman and his book Charcuterie: The Craft of Salting, Smoking and Curing Meat for giving me the background I needed to begin this journey. As mentioned I chose bacon as my salt cure challenge. It is a classic taste that I wanted to explore and it is also the most familiar to me, not that I wouldn’t love to make pancetta or guanciale next time around. To begin, I picked up a 5lb pork belly from my local butcher, they were quite excited when I mentioned that I was making bacon, but not as excited as I was of course. With pork belly in hand I began the process of preparing the cure. The basic must have ingredients for curing a pork belly are kosher salt, “pink salt”, and sugar. Pink salt is basically regular salt with 6.25% sodium nitrite, but it is colored pink so it is not confused with regular table salt as it is not edible on its own. The sodium nitrite helps to inhibit bacteria growth, prevents botulism and helps to maintain the color of the meat. In addition to the three basic ingredients I also added minced garlic, ground guajillo chiles, ground cumin, Mexican oregano and pepper. I work with these flavors quite often and I simply had to use this combination. It also helps to add some smoky flavor to the bacon as I do not currently own a smoker. I made sure to create an even layer of my curing combination all over the pork belly. I shook off the excess and placed the pork belly in a large 2 gallon ziploc bag and placed in a dish in my refrigerator for a week. I followed the book’s instructions and made sure to flip the pork belly once every day to assure that both sides cure evenly. Believe me when I say it was not easy to wait for this bacon to be ready, I was excited for the results. After a week I rinsed off the pork belly and patted it dry. I then placed the pork belly in a preheated 200 degree oven for about 2 hours. Once out of the oven, I used a sharp knife to remove the skin from the belly while the underlying fat was still warm. The skin can be placed back in the oven at a higher temperature until it crisps up, then you have cracklins. Deep fry it and you have pork rinds, did someone say bonus? So now I have my bacon, it smells good and of course I cut off a piece and gave it a shot, it was very salty on the outside, but quite tasty. 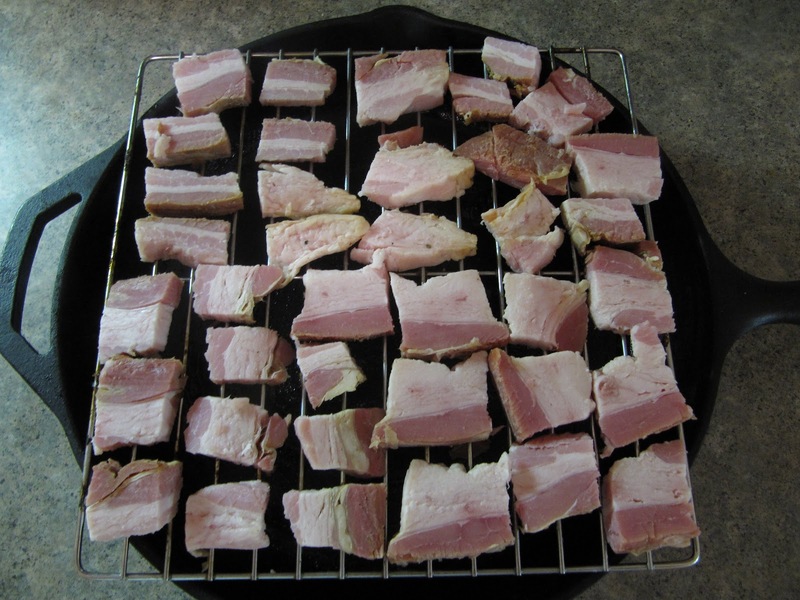 Now that the bacon is done, it can be used alone or cut into cubes and added to all kinds of dishes. For me one of the dishes that showcases the goodness of this ingredient is frijoles charros. 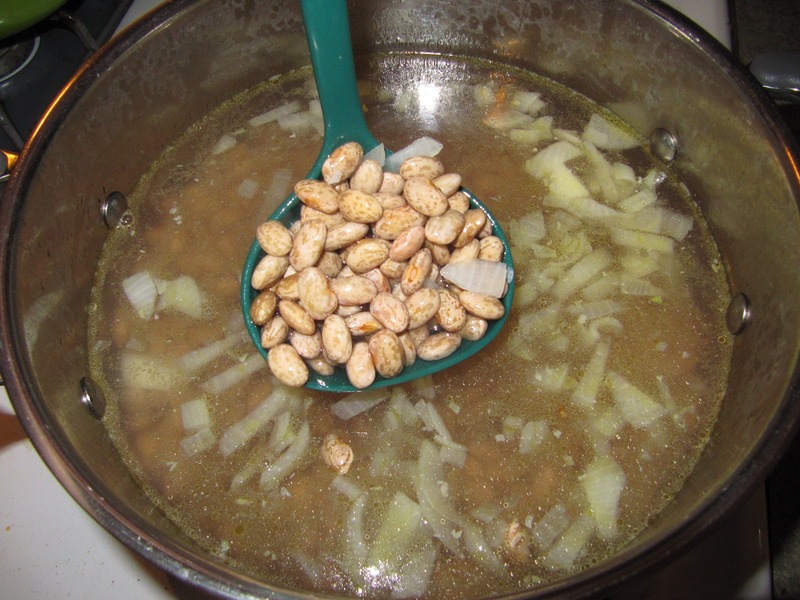 Frijoles charros is a dish I grew up with and it was always a favorite of mine. It is a primarily a dish of the northern region of Mexico and every family has their own version. I personally think of frijoles charros as the original chili, a very rustic mexican predecessor to a classic American dish. I could also say that this is a mexican version of pork and beans, though I think that is simplifying it a bit. Rather than a tomato base found in chili, the main liquid component is the bean liquor you get from slow cooking pinto beans for a few hours. If you’ve had beans cooked from scratch you know that this liquid is as important and delicious as the beans themselves: it is luscious, deep and earthy. This is the perfect foundation for a dish involving pork, chiles and of course tortillas to scoop it all up. 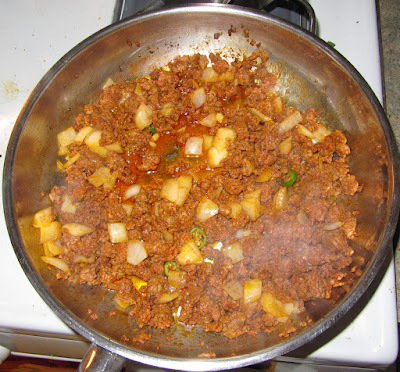 For my version I chose to add of course chunks of the bacon I just made along with chorizo, onions and serrano chiles. 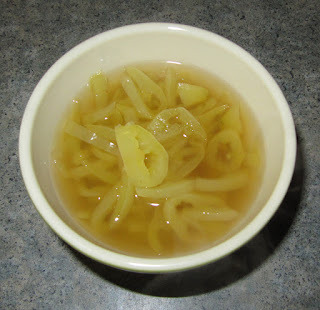 My favorite accompaniment to frijoles charros are pickled Hungarian wax or banana peppers. The acid and the extra kick really bring the beans to life. The morning of frijoles charros day I soaked a few cups of pinto beans in cold water and let them sit for at least 5 hours. This can be also done overnight if cooking the next morning. In a large pot I sautéed onion and garlic in some olive oil, this will serve as a base flavoring for the beans. Do not add salt until after the beans are cooked! I added the pinto beans with the soaking liquid to the pot and added more water until it was a couple of inches above the beans. It is very important to keep the soaking liquid and not discard it, there are many nutrients and you also get rid of any potential starchy liquid that will aid in getting a thick creamy broth. People say that you can reduce gas by tossing the soaking liquid but I think it is just a waste and honestly if you’re in for beans and pork you kind of have to assume and accept a certain amount of “after effects” lets say. I turn the heat to high and keep beans at a hard boil for about 5 minutes then I turn it to a low heat, just short of a simmer for a couple of more hours until the beans are cooked through and are toothy but then creamy when you bite into them. While my beans cooked, I cut up some of my bacon into bite-sized chunks. 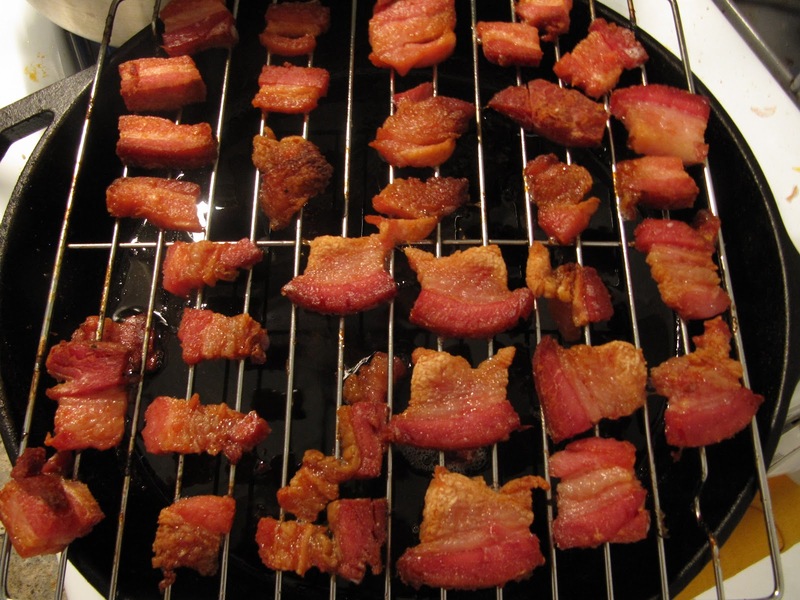 In order to achieve even cooking and crispness I placed the bacon on a cooling rack I placed over a cast iron skillet and placed in a 350 degree oven for 20-30 minutes. The bacon came out crispy and still sizzling with a slight hint of spices that will compliment the dish well. I took the bacon out of the oven and added this to the beans to simmer, allowing the salt from the bacon to further flavor the beans. Finally I simmered chorizo with onion, garlic and serrano chile. Once the chorizo was cooked through I mixed the mixture into the beans as well. The spice of the chorizo goes well with the beans as well as adding more texture to the dish. This is where you can add additional salt as needed. I continued to simmer this for a few more minutes and it was ready to eat! I prepared a quick pickle of Hungarian wax peppers to accompany the dish. As mentioned before the addition of acid and more heat is a must for me when eating frijoles charros, it really cuts through the richness and adds an additional bite. I thinly sliced the pepper and simmered in apple cider vinegar along with salt and pepper for a few minutes until the pepper softened and imparted some of its heat into the vinegar. While finishing the dish I received a great tip from my brother and frijoles charros enthusiast 2bridgesflavor. He suggested placing a fried egg on top, which was the perfect addition to the beans and the yolk made the dish just that much better so I have to thank him for that. Being able to add my own bacon to one of my favorite dishes was truly a great experience and I’m glad that I took that first step in experimenting with charcuterie. So far this has been a truly eye-opening experience and I already see many possibilities ahead. When I read bacon, the first thought that came to my head was “frijoles charros” and what better dish for some mexican bacon! 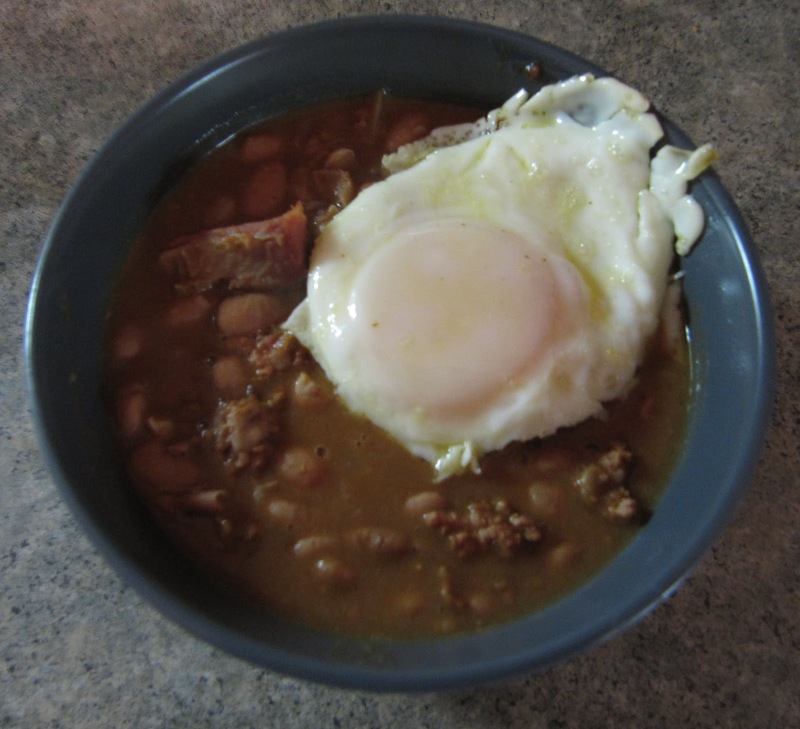 I encourage everyone to give this dish a shot, it is a lesser known Mexican classic that will make you look at chili and pork and beans in a completely different way. 1.) The morning of cooking, place the pinto beans and water in a large bowl and allow them to soak for 5-6 hours or overnight. 2.) In a large pot, sautee ½ of the onion and 2 cloves of garlic until translucent. 3.) Add the beans and soaking liquid to the pot, adding more water as needed to assure that it covers the beans by at least 2 inches. Boil on high for 5 minutes, then simmer on low for 2 hours or until the beans are tender. 4.) Place the sliced bacon on a rack on a cookie sheet and roast in the oven on 350 degrees or until bacon is crisp, making sure not to burn it. 5.) In a separate pan, sauté the chorizo and serrano with the leftover onion and garlic until the chorizo is cooked through. 6.) Add the bacon and chorizo to pot of beans and simmer for an additional 10 minutes. This is where you can add salt and pepper to taste along with the other spices as needed. 2.) Add the thinly sliced peppers to the saucepan and heat through for about 5 minutes. Add salt and pepper to taste. Serve as a garnish for the frijoles charros. This dish looks delicious! I grew my own beans last summer and have a nice gallon jar of them in my pantry, and now some of them are earmarked for this recipe. Thanks for the great post! thanks mosaica, let me know how it works out! Thanks for sharing this. I'm so torn, admiring your Charcutepalooza post and the Pozole post earlier :-). I'm a big fan of frijoles in almost any preparation, but this one looks especially tantalizing! Love the combo of chorizo and bacon, and the egg on top is perfection! use a propane torch on the bacon when its 95% done. yer grillin it in the pan and gives the beans a grilled flavor. do any meat that way. bar b que any time no matter the weather. thanks for the tip wwalkingwolfw, I'll definitely give this a shot next time. I'm glad I know have a completely different way to use my torch! yer welcome!. some call it the "hobo hibachi" cos you can pack it and grill anything. like RATS!! bleh. but chefs use them all the time to caramelize sugar on their sweets. and maybe to add a touch of grilled flavor to some meats dishes. i use mine all the time. on bacon it's awesome. it hard to grill sliced bacon with all the fat dripping. too many flame-ups. just pile the bacon in one side of the skillet and turn on yer vent fan. and don't keep the torch in one place for too long. just til it chars a bit then move on. stir the pieces to char all sides, of course. it's also a good way to grill fish fillets. also hit yer french fries a tad. grilled fish-n-chips. yummeh! anything you can put on the grill and more can be grilled in the skillet rain or shine. to hot to grill out? do it indoors. if you want smoke flavor, buy a tabletop grill. place in on the stove with the vent directly under the stove fan. open the bottom grill vent and then use yer torch to set a few small pieces of oak or whatever grilling wood you can get/prefer till they flame. then place yer meat (already on the wire grill) on the grill and close the lid. the wood will stop flaming and smoke. the embers will die later and you may need to torch the wood again depending on how strong a smoke flavor you desire. let the smoke fully dissipate before removing the lid, depending on how close yer smoke detector is and the overall room size/weather/window proximity. meaning if it's cool out open a window and drive yer neighbors crazy with the beautiful odors wafting from yer kitchen. if you love campfire scent and bar-b-que like i do you won't mind a smokey odor in yer home. give it a try. then you can have all the flavors of an outdoor grilling without having to go to all the trouble of setting up the session. real wood beats nasty charcoal any day. when i do grill outdoors, i use the technique of my Cherokee ancestors. you let yer flaming wood become glowing coals and you place the meat right on the coals. toss the stupid grill. you won't have to clean it hehe. the meat is imparted with a slight woody flavor. ppl i've cooked like this for said it was the best grilled meat they ever tasted. sear it well on all sides and it will hold in all the yummy juices. my fave meat done this way is pork tenderloin. fish fillets may not work this way tho. they'd fall apart. the old way of grilling fish is on a spit or sticks. or baking on hot rocks or buried in leaves in coals to steam bake.